Get your year sorted in 2019 with these gorgeous monthly calendar printable pages. Whether you add them to your planner, or to the wall – they will help you get organised each month – and there are 3 gorgeous designs to choose from (grid, colouring in, and list versions). 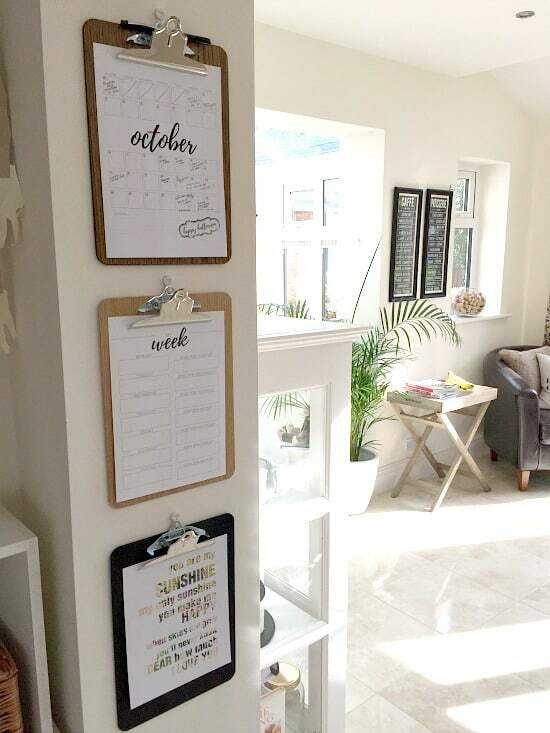 I am SO excited for these new printable monthly calendar pages, because they truly are one of the best ways we use to keep organised throughout the year. As always, I create a set of monthly calendar printable pages – but this year I’ve gone 2 steps further and created 3 different sets! I can’t wait for you to take a look…..
HOW CAN YOU USE THE MONTHLY CALENDAR PAGES? With a page for each month of the year, these printables are perfect either for adding to your planner, OR (and my favourite way by far) you could add to the wall to keep track of the high level stuff over the year. TIP – Use a clipboard to have them all up, and just rotate through the year as you need them (the top clipboard in the picture below is an older version of the monthly planners, and we use them each and every year). etc… – and I would definitely say to use them for whatever works best for you. What we tend to do as a family is to have these as a central place to put the stuff that comes up that is over and above the usual schedules that we all have – and it works brilliantly. After all, it would be FAR to much to try and add everything we all do into each section – so we just track things like evenings out, visits to friends and family, appointments etc… – so that we can quickly glance at it each day to make sure the out-of-the-norm stuff isn’t forgotten. So – are you ready to take a look at the different versions? Let’s get going! This is the ‘usual’ format I create, and one that’s always popular with my readers – so I’ve updated for 2019 for you if you like this style. I love that it’s black and white, because you can keep it very simple and classic, OR add colour through stickers and/or coloured pens (a great idea is to colour code per person in your house so you can see at a glance what YOU need to concentrate on). This is the version that I think I’m the most excited about, because I really do love a bit of colouring-in! I plan to add these to my diary, and that way I can doodle and colour to my hearts content! I could also see us having these up on the wall at some point, as they would look great either left black and white OR coloured in (my little girl has already got her own set and is LOVING colouring them in!). Journalling – a sentence per day is a great way of doing this quickly! Lastly – it’s worth noting that these printables are all available in 2 different sizes – A4 and Letter. As such, whether you are in the UK and use A4 paper, or in the US and use Letter sizes – they are BOTH included in all versions – as I don’t want you to miss out! So – there you have it – the 2019 Printable Monthly Calendar pages for your planner – ready for you to use now! I am so excited about these, and can’t wait to hear about how you use them, and what you think about the new versions. They also work really well with the diary planner pages, and I have them on offer as a bundle for 25% off their individual prices – so you can grab a bargain now! CLICK HERE FOR MORE DETAILS OF THE 25% OFF BUNDLE. Previous Post: « THE 2019 PRINTABLE DIARY PAGES ARE HERE!